The basking sharks are the second largest shark species in the world after the whale shark, and reach lengths of 33 feet (10 m). They have a mottled gray or brown coloration, pointed snouts, a huge mouth, and enormous gill slits that nearly encircle their heads. 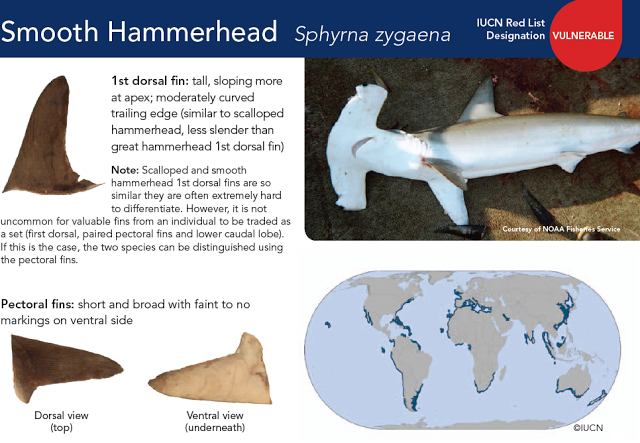 Often their most visible feature is their prominent dorsal fin (see photo). They are generally considered to be sluggish sharks, often seen “basking” at the surface as they swim slowly along with their large mouths open to filter water for food. Basking sharks are very social animals, often being spotted in small groups of 2 or 3 individuals, up to very large groups of 500 or more. In 2010, the National Marine Fisheries Service (NMFS) identified basking sharks in the eastern North Pacific Ocean as a “Species of Concern.” Species of Concern are those species about which (NMFS) has some concerns regarding status and threats, but for which insufficient information is available to indicate a need to list the species under the Endangered Species Act. The designation is a means to draw proactive attention and conservation action to these species. North Pacific basking sharks are also listed as “Endangered” by the International Union for the Conservation of Nature (IUCN). 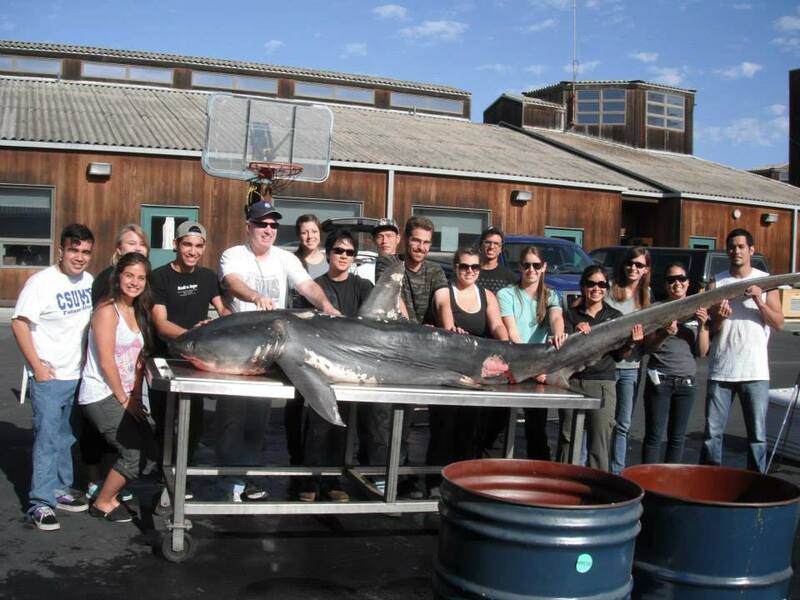 1) A dramatic population decline of basking sharks off the coast of Canada and California since the 1900’s. 2) No signs of population recovery 50 years after the closure of the basking shark fishery in the eastern North Pacific. 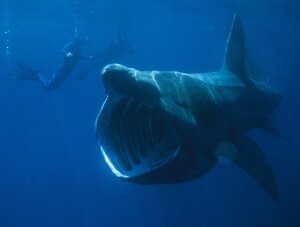 Basking sharks reproduce very slowly, which contributes to a slow rate of population recovery. Scientists estimate that basking sharks only reproduce every 18 months to three years, and bear litters of one to six pups. However, much of basking shark biology remains a mystery. Basking sharks also remain vulnerable to human activities, including collisions with vessels when they feed at the surface, accidental entanglement in fishing gear, and illegal harvesting of their fins for shark fin soup. Though basking sharks are charismatic giants among fishes, we still know very little about how many there are, where they live, and where they go in the Pacific Ocean. Reporting your sightings can help us gather this crucial information to inform a recovery plan for this species of concern. Where Do Basking Sharks Go? Basking sharks have been reported all over the world, from arctic waters to the tropics. They are most commonly observed in coastal temperate waters, such as the waters of California, where they are frequently seen feeding at the surface. Scientists believe that basking sharks on the Pacific coast of North America belong to a single population that seasonally shifts from north to south between Canada and central California. Basking sharks have been sighted in waters across the Pacific, from North America to the Hawaiian Islands, and from Japan to China and Taiwan. Studies of basking sharks in the North Atlantic have revealed their capacity to make long distance migrations across the ocean basin. The full geographic range and of basking sharks in the North Pacific is unknown; consequently, it is not clear whether one or more populations occur in the North Pacific. Reporting your basking shark sightings can help us fill in these knowledge gaps. Like baleen whales, basking sharks are filter-feeding giants that eat vast quantities of some the ocean’s smallest inhabitants: zooplankton. Unlike the megamouth and whale sharks, the other filter-feeding sharks which actively pump or gulp water to ingest prey, basking sharks rely entirely on the passive flow of water over their gill rakers. They can often be spotted cruising through the water with their giant mouths open. An adult basking shark swimming at a constant speed of two knots passes about 2,000 gallons of water over its gills per hour! An individual shark may have as much as a half-ton of food in its stomach. Visit our Basking Shark Resources page to for links to more basking shark information.